These fashionable suits feature a secure pocket to hold your breastform securely in place--no matter your activity level. Look your best . . . there is no need to compromise or adjust your lifestyle. Clear Silicone, clear form with a hollow, concave back which allows water to flow through for maximum comfort and confidence in and out of the water. Safe to use in salt water, hot tubs and spas. You'll be sure to catch eyes in this cute swim dress in watery blues with geometric pattern on the fabric. Three button adjustable straps insure a great fit. Be as active as you like with laps in the pool or body surfing at the beach. All of our suits have high armholes and pockets for breast forms so you can be your gorgeous self without concern. Geometric pattern both catches the eye and the watery blues lets you fade into the surroundings. Stand out from the crowd with geometric blues. Good for a balanced body shape because it does not draw the eye up or down. Adjustable bottom edge with drawstring. Pair with swim skirt or shorts for a fit that works with long or short torso. Top only. Turquoise and blue feathery scales transform you into a watery chimera. Gathers at the waist accentuate figure. Boyleg gives suit a classier cut. Black background with blues and greens dancing over it reminiscent of the reflections off the water. Sarong style flatters all body shapes and wrap front flap provides touch of modest coverage without interfering with swimming. Three button adjustable straps. Fashion on the sand in a black swimsuit decorated with watery ribbons of green and blue like light on the water. 3-Button adjustable straps. Playful comfort on the water. Interweaving ribbons in three colors, yellow, green, and blue dance like the light off the water on a black background. Adjustable drawstring at bottom edge. Pair with black swim skirt for a fit perfect for all torso lengths. This swimsuit has a forgiving fit that leaves you free to enjoy yourself. Top only. Get in the mood for watery fun with this fanciful play of blue on black reflecting the way light plays on water. Dashes of pink green and yellow add keep the eye moving. Good fabric for a balanced body shape. Three-button adjustable straps. White pointed strips on this black suit show you mean serious business on the water. Don't let your active lifestyle get constrained by your breast form. Suit has high arm holes and high chest to keep everything in place no matter your activity level. Ink wash tropical leaves are blazed down the middle of this tank suit suitable for serious swimmers. Black panels on the sides speed you along. Laps at the pool or playing in the waves, this suit lets you be as sporting and competitive as you please while looking great. Black background with four stripes of purple, violet and blue. Pocket for breast form and high neck and sidearm keep you secure while letting you move. Playful tropical pattern of white leaves on black accented with purple and light blue. Sarong "wrap" style flatters a wide range of figures. Lets you keep active while providing just a touch of modesty. 3-Button adjustable straps. Classy tropical fabric top for two-part swimsuit. White leaves on black with daubs of purple and baby blue. Pair with swim shorts or skirt for a comfortable fit. Top only. A more modest and forgiving version of the Riverside suit. Small gathers at neckline soften bust line. Teal, peacock blue wash across the background of a black illustration of tropical plants. Shirred waist slims the middle. Strap rings in front. Straps are adjustable in back. Swim shorts for suit separates that lets you move the way you want to. Pair with swim top for a comfortable set sure to get you out on the water. Bottom only. The Basic Black Skirt for the beach. Incorporates a control brief so you get the best of both worlds, chic modesty and swimability. Bottom piece only. 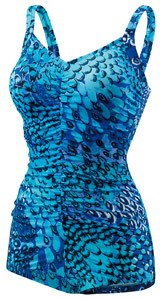 A woodland jungle of flattering colors run in vertical waves on this suit top. Adjustable drawstring and two pieces assures a perfect fit for all body types. Top only. Pair with Swim Skirt. Sophistication that calls out to chocolate and coffee browns. Drape/wrap style forgives and accentuates. The height of sophistication in one-piece suits. Drape/wrap across the front accentuates as it forgives.